To book in person or by phone the Box Office is open Monday - Saturday 10am until approximately 30 minutes after the start of a performance. On non-performance days the Box Office closes at 5.30pm. To book by phone call 024 7637 6707 to reserve your tickets. You can pay instantly using Visa, Mastercard, Switch or Delta and for 30p your tickets can be posted. To book by post send a cheque together with details of the number of tickets required for each performance and your daytime phone number. Cheques should be made payable to 'Nuneaton and Bedworth Borough Council'. Unpaid reservations are held for 10 days. Reservations not collected will be released for sale. It is regretted that tickets cannot be exchanged or money refunded after purchase. Pay and display car parking is available at the rear of the Civic Hall. Parking for orange badge holders is also available. Customers in wheelchairs are requested to book a designated wheelchair space. Toilet facilities are available. A licensed bar open half an hour before showtime and during intervals. There is also a coffee bar for the sale of hot snacks, light refreshments, ices, minerals, tea and coffee. 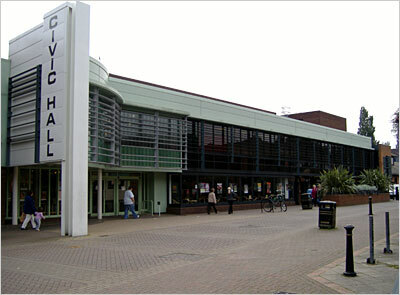 The Civic Hall is owned and managed by Nuneaton and Bedworth Borough Council. Email civic.hall@nuneaton-bedworthbc.gov.uk for more details.